His mother Hannah Francis Conway was born in Hoboken New Jersey, USA. His father Charles Edward Tingley was born in Shepody, Albert County, New Brunswick. 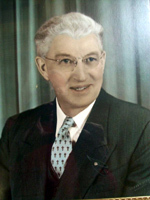 He was Mayor when Campbellton gained City status in 1958.
and UNB. Faculty of Law (BCL) (1940).